Traveling north from Bedford near the Pennsylvania Turnpike (Interstates 70 & 76) to I-80 near Bellefonte, Interstate 99 represents another growing Interstate corridor. Also known as the Appalachian Thruway and the Bud Shuster Byway, it is the first Interstate highway to have its designation written into law (National Highway Designation Act of 1995). Several other Interstates, including I-66 in Kentucky, I-86 in New York, and I-69 in Texas, have since had their designations written into law. Located east of Interstate 79 and west of Interstate 81, Interstate 99 is the bane of many road enthusiasts who treasure an orderly and sequential numbering system for Interstate highways. The numbering of this highway was determined by Congressman Bud Shuster. He was responsible for writing Interstate 99’s designation into the 1995 National Highway Designation Act. The number “99” violates the standard numbering convention associated with Interstate highways. According to numbering guidelines, I-99 should be hugging the Atlantic coast, not the small Pennsylvania cities of Altoona and State College. Under the orderly system, the lowest numbers are on the West Coast and the highest numbers are on the East Coast. While central Pennsylvania is pretty far east, it is still away from the Atlantic Ocean. Several north-south routes, including Interstates 81, 83, 87, 89, 91, 93, 95 and 97 all lie east of Interstate 99. Interstate 99 in central Pennsylvania is part of High Priority Corridor 9: Appalachian Thruway Corridor. Interstate 99 between Bedford and Bellefonte overlaps with U.S. 220 for its entirety, and it will continue along U.S. 220 until reaching U.S. 15 at Williamsport. Interstate 99 is currently cosigned with U.S. 15 in New York, and will overlap or replace U.S. 15 southward to Williamsport when it is finally signed. The southern terminus of Interstate 99 in Bedford may change in the future, as the highway is part of the Appalachian Thruway/High Priority Corridor 9. Improvements are envisioned for U.S. 220 south to Cumberland, though expansion to Interstate standards are not presently planned. It is also possible that Interstate 99 could continue north all the way to Rochester via Interstate 390. Although some discussions have considered the possibility of Interstate 83 continuing north to Rochester, it does not appear that will occur due to the large gap of Interstate-standard freeway between Harrisburg and U.S. 15. An Environmental Impact Statement for I-99 over Bald Eagle Ridge was completed by PennDOT in 1996. The approval of TEA-21 by Congress in 1998 included a two-sentence rider by U.S. Rep. Bud Shuster that eliminated federal oversight of Interstate 99.3 Subsequent approval for Interstate 99 between Bedford and Bald Eagle was approved by AASHTO”s Route Numbering Subcommittee on November 6, 1998. 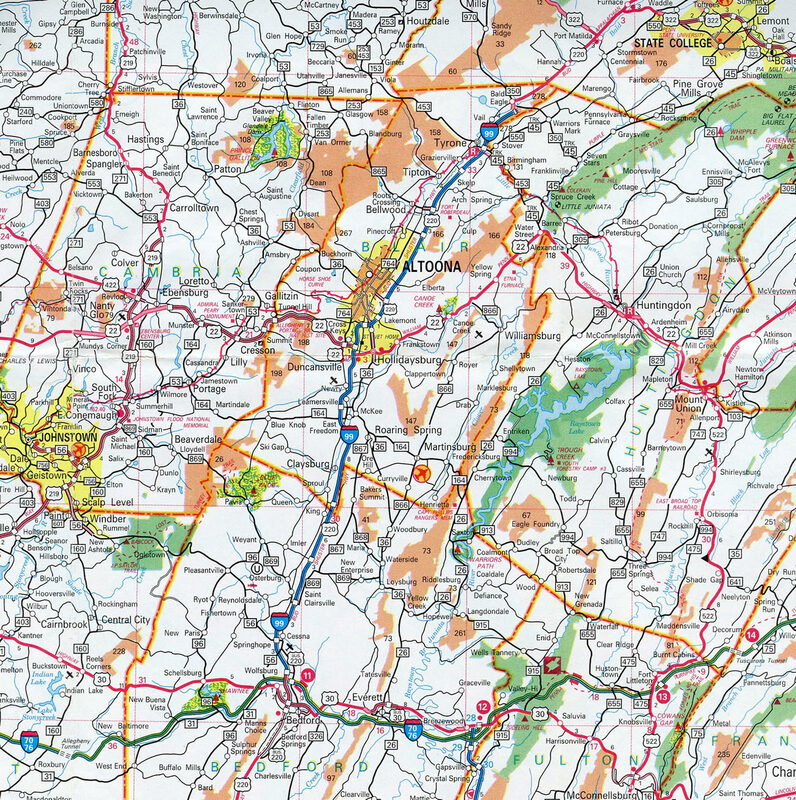 Interstate 99 debuted on the 1995 Official Pennsylvania Highway map from its trumpet interchange with the U.S. 220 Business access road in Bedford to Pennsylvania 350 at Bald Eagle. Three Future Interstate 99 corridor signs were posted along U.S. 15 northbound between Williamsport and the New York state line, including this assembly at the north end of the Mansfield Bypass. U.S. 15 Business merges onto U.S. 15 northbound ahead. Photo taken 05/07/05. The remainder of Interstate 99 in Pennsylvania is a future route with signs proclaiming its extension along U.S. 220 to Lock Haven and Williamsport, then northward along U.S. 15 to the state line at Lawrenceville. Several decades of construction upgraded U.S. 15 between Williamsport and Painted Post to limited access standards. A new freeway for U.S. 15, from Tioga, Pennsylvania north to Lindley, New York, opened after a ribbon cutting ceremony held on October 1, 2008. The seven mile segment cost $118.7 million.7 See photos of the roadway on John Walter’s site. Traveling north along the original U.S. 15 freeway to Interstate 86 & New York 17 at Painted Post. A diamond interchange jointed the two freeways at the time. Photo taken by Douglas Kerr (10/05/02). A trumpet interchange joined U.S. 15 with adjacent New York 417 just south of the ramps for Interstate 86 & New York 17 (Southern Tier Expressway). This exit was reconfigured into a wye interchange during the second phase of the Painted Post Interchange project. Photo taken by Douglas Kerr (10/05/02). Traffic departed from the ending U.S. 15 north for Interstate 86 & New York 17 east to Corning and Elmira. Ahead was a left-hand turn for I-86 west and New York 15 north at a signalized intersection. Photo taken by Douglas Kerr (10/05/02). Hamilton Street (NY 415) extended north from the freeway end into the village of Painted Post. The diamond interchange with the Southern Tier Expressway here replaced a circle-interchange built in the late 1950s. That design was replaced in 1987.13 Photo taken 05/07/05. Button copy guide sign posted ahead of the off-ramp (Exit 44) for U.S. 15 south and New York 417 west during the Painted Post Interchange project. U.S. 15 was previously upgraded to a freeway between New York 17 and Presho. Photo taken 07/01/05. Westbound Interstate 86 & New York 17 combined with New York 15 north from Exit 44 as U.S. 15 south began. NY 15 was designated along the former U.S. 15 route between Painted Post and Rochester in 1974. Photo taken 07/01/05. A signalized turn took motorists from New York 17 (Southern Tier Expressway) south onto U.S. 15 south at Painted Post prior to the multi-year project to build the semi directional T interchange for the eventual I-99. Photo taken by Bryan Farr (04/15/02). An auxiliary lane accompanies Interstate 86 & New York 17 east from New York 14 (Exit 43) to the interchange complex (Exits 44A/B) with Interstate 99 & U.S. 15 south and New York 417 (Hamilton Street) west. Photo taken 01/18/17. Exit 44 expands to two lanes as it separates from the I-86 eastbound mainline. A two lane flyover shuttles motorists onto I-99 south to Lawrenceville, Pennsylvania while a single lane ramp lowers to Hamilton Street at the village of Painted Post. Photo taken 01/18/17. Interstate 99 & U.S. 15 overlap south by Presho and Lindley to the Pennsylvania state line. U.S. 15 extends south from there as a freeway to Mansfield and I-180 at Williamsport. NY 417 is the pre-freeway alignment of NY 17 between Olean and Gang Mills in southern Allegany and Steuben Counties. Photo taken 01/18/17. Interstate 99 & U.S. 220 travel north from the Mount Nittany Expressway (U.S. 322) at State College to Interstate 80 east of Bellefonte. The freeway transitions into an at-grade expressway at Musser Lane, 0.4 miles ahead of the eastbound on-ramp for I-80. These overheads were removed by 2005. A new assembly was installed by 2015 and the concrete roadway was covered with asphalt. Photo taken 04/30/05. Jacksonville Road (former PA 26) ties into I-99 & U.S. 220 at an intersection preceding the parclo A2 interchange with I-80. This set of signs, still referencing the former U.S. 220 Alternate route along I-80 west to Milesburg, was later removed. Photo taken 04/30/05. U.S. 220 north accompanies I-80 east for 17 miles. U.S. 220 Alt south to Milesburg and Unionville was decommissioned with the completion of Interstate 99 at Port Matilda. Photo taken 04/30/05. Pennsylvania 26 north reduces to two lanes ahead of the I-80 overpasses and westbound on-ramp to Dubois. Photo taken 04/30/05. Interstate 80 proceeds west from I-99 to DuBois, Clarion, Sharon and Youngstown, Ohio. Pennsylvania 26 continues northeast to Jacksonville and Howard. Photo taken 04/30/05. An end shield preceded a wye interchange taking U.S. 220 back onto its old alignment from I-99 at Bald Eagle. Photo taken by Oscar Voss (07/99). Pennsylvania 350 (7 Stars Road) westbound combined with U.S. 220 at a T-intersection just north of the temporary freeway end of I-99. Photo taken by Tim Reichard (04/07/02). Pennsylvania 350 combined with U.S. 220 north to U.S. 220 Business (Eagle Valley Road) at nearby Bad Eagle while U.S. 220 south combined with Interstate 99 to Tyrone and Altoona. The temporary freeway end is now an access road linking Bald Eagle with I-99 via a diamond interchange (Exit 52). Photo taken by Tim Reichard (04/07/02). U.S. 220 turned south from Eagle Valley Road to overlap with Pennsylvania 350 to the Interstate 99 access road beyond 7 Stars Road. PA 350 still turns east here toward Warriors Mark and Seven Stars. Photo taken 04/30/05. U.S. 220 extended south from 7 Stars Road to a temporary wye interchange at the southbound beginning of Interstate 99. The interchange was reconfigured into a diamond to provide access from PA 350 and Bald Eagle for I-99 north to State College. Photo taken 04/30/05. Interstate 99 & U.S. 220 continue south from a diamond interchange (Exit 3) toward Exit 1 for the Pennsylvania Turnpike. The two-mile guide sign for the turnpike connection precedes the Pennsylvania 56 (Pensyl Hollow Road) over crossing. Photo taken 04/30/05. An end shield for I-99 stands ahead of the trumpet interchange (Exit 1) with the access road linking U.S. 220 with U.S. 220 Business. The U.S. 220 freeway extends another seven miles beyond Bedford. The US highway reaches the Maryland State line in 27 miles. Photo taken by Oscar Voss (07/99). Similar to Breezewood, the connection between Interstate 99 and the turnpike leads motorists by several gas stations and fast food restaurants through Bedford Township. Photo taken 04/30/05. U.S. 220 Business extends 3.1 miles north to end at Interstate 99 along side Pennsylvania 56 at Cessna and south 0.3 miles to the Pennsylvania Turnpike ramps at Exit 146. Photo taken 04/30/05. Interstates 70 and 76 split 17 miles to the east, while the Steel City of Pittsburgh is 100 miles to the west via the Pennsylvania Turnpike and Interstate 376. Downtown Bedford lies 2.6 miles ahead on U.S. 220 Business south. Photo taken 04/30/05. The ground level sign for the off-ramp to U.S. 220 Business and I-70 & 76 (Pennsylvania Turnpike) on I-99 south was replaced with an overhead assembly by 2005. Photo taken 10/08/01. Following the access road from I-99 and U.S. 220 east to U.S. 220 Business in Bedford, motorists saw this set of trailblazers for I-70, I-76 and the PA Turnpike. These were replaced by 2009. Photo taken 04/30/05. This oversized cutout for the Pennsylvania Turnpike directed drivers onto the ramps for I-70 & 76 east to Breezewood and west to New Stanton. The shields were removed by 2009, while the overall assembly was replaced by 2016. Photo taken 04/30/05. I-70 & 76 parallel U.S. 30 closely on the two mile approach to Exit 146 with U.S. 220 Business in Bedford Township. Photo taken by Chris and Amber Lokken (06/24/08). Passing north of Wolfsburg, the Pennsylvania Turnpike continues to within one mile of the trumpet interchange (Exit 146) for Bedford. Interstate 99 and U.S. 220 combine north to Altoona, Bald Eagle and State College. Photo taken by Chris and Amber Lokken (06/24/08). Exit 146 departs following the Bugle Road and U.S. 220 freeway overpasses for U.S. 220 Business. U.S. 220 Business leads motorists north 0.3 miles to an access road linking with I-99 north to Altoona and U.S. 220 south to Cumberland, Maryland. A similar surface route connection links the PA Turnpike with I-81 at Carlisle. Photo taken by Chris and Amber Lokken (06/24/08). The Pennsylvania Turnpike angles northwest from The Narrows across Evitts Mountain to meet U.S. 220 Business at Exit 146. I-99 & U.S. 220 travel northeast to State College. Photo taken 10/15/04. U.S. 220 Business travels north from the borough of Bedford to cross paths with the Pennsylvania Turnpike in one mile. The surface arterial connects I-70 & 76 with I-99 via an adjacent access road. The connection requires navigating through two signalized intersections. Photo taken 10/15/04. Entering the trumpet interchange (Exit 146) with U.S. 220 Business on I-70 & 76 westbound. U.S. 220 Business parallels I-99 & U.S. 220 north to Cessna. U.S. 220 continues south from the end of I-99 another seven miles to Cumberland Valley. Photo taken 10/15/04. The signalized end of the Exit 146 access road for U.S. 220 Business. According to William F. Yurasko, a button-copy sign including an I-99 shield was previously posted at this location. Photo taken 10/08/01. Approaching the access road connecting U.S. 220 Business with Interstate 99 and U.S. 220. Overhead signs were added here by 2008. Photo taken 10/08/01. Replaced by 2005, traffic partitioned into ramps for I-99 & U.S. 220 north to State College and U.S. 220 south to Cumberland beyond this set of button copy overheads. Photo taken 10/08/01. The first confirming marker for Interstate 99 north. I-99 & U.S. 220 north travel 32 miles to Altoona. Photo taken 10/08/01. “Steuben County stretch of Route 15 designated as Interstate 99.” The Leader (Corning, NY), June 27, 2014. “Infrastructure – Speed limit extension announced.” Wayne Independent, The (Honesdale, PA) May 7, 2016. 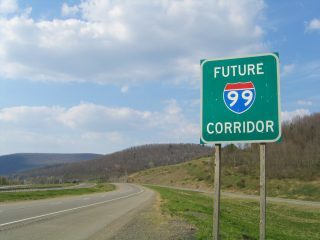 “Long-awaited Interstate 99 Finished – Road was Long, Rocky and with Stops for Direction.” Centre Daily Times (State College, PA), November 23, 2008. “Map Makers Must Draw in New I-99.” Centre Daily Times (State College, PA), December 1, 1995. “Drivers Hit Onramps of New I-99.” Centre Daily Times (State College, PA), November 26, 2002. “I-99 Link Opens – Connection to Skytop Complete after Years of Setbacks.” Centre Daily Times (State College, PA), December 18, 2007. “Work complete on U.S. 15 section.” Leader, The (Corning, NY), October 2, 2008. “Final phase of U.S. 15 upgrade underway – I-99 Conversion.” Leader, The (Corning, NY), August 21, 2012. “I-86, Rt. 15 interchange under way.” Leader, The (Corning, NY), January 7, 2004. “Interchange project prepares for final phase.” Leader, The (Corning, NY), October 22, 2004. “Interchange complete.” Leader, The (Corning, NY), August 14, 2008. “Route 15 open for business 10-year future I-99 project hits finish line in Lindley – 10-year future I-99 project hits finish line in Lindley.” Leader, The (Corning, NY), October 9, 2013. Interstate 86 / Route 15 Interchange Website – Project History, http://www.dot.state.ny.us/reg/r6/i86_project/i86projhistory.html NYSDOT. Page updated January 23, 2017.